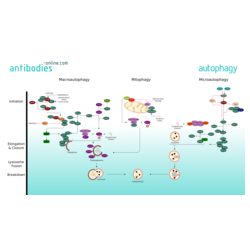 Macroautophagy is executed by more than 30 autophagy-related (Atg) genes. 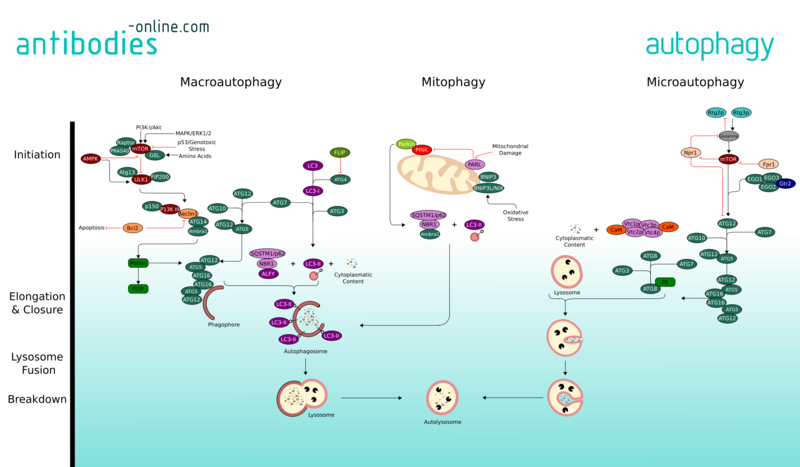 In mammals, amino acids, growth factors and ROS regulate the activity of protein kinases mTOR and AMPK. These two are crucial for autophagy regulation through inhibitory phosphorylation of the Unc-51-like kinases ULK1 and ULK2. ULK is part of a protein complex containing Atg13, Atg101 and FIP200 and phosphorylates and activates Beclin-1. The active ULK and Beclin-1 complexes re-localize to the site of autophagosome initiation, the phagophore, where they both contribute to the activation of downstream autophagy components. The class III PI(3) kinase complex mediates the nucleation of autophagosomes. VPS34 phosphorylates the lipid phosphatidylinositol and generates phosphatidylinositol 3-phosphate (PtdIns(3)P) on the surface of the phagophore. Downstream of PtdIns3P production, WIPI2B links PtdIns(3)P to LC3 lipidation through ATG12–ATG5-ATG16L1 (E3-like) complex. The two ubiquitin-like proteins of ATG8 and ATG12 induce the elongation and expansion of the phagophore membrane. Lipidated LC3 form of LC3, known as LC3-II, contributes to the closure of autophagosomes and enables the docking of specific cargos and adaptor proteins such as Sequestosome-1/p62. The completed autophagosome then fuses with the help of SNARE and UVRAG with a lysosome. The contents of the autolysosome are degraded and their basic modules are released from the vesicle through the action of permeases.